But the northern lights, sparked by a burst of radiation from the sun, stayed off in southern Maine. A massive burst of radiation from the surface of the sun earlier this week created good conditions Friday evening for seeing the northern lights in areas far south of where they typically show up, including Maine. But the lights stayed off, at least in southern Maine. 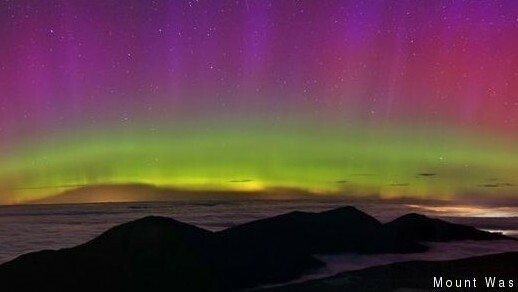 There were a few reports of bright displays of the aurora borealis Friday night, with a particularly spectacular photo sent out by the Mount Washington Observatory in New Hampshire. Northern lights were also reported in Caribou, but there wasn’t any showy display in Portland, despite a few die-hard observers who ignored a chilly wind and hoped to catch a glimpse. “I’m going to blame that bean plant over there,” said Maggie Hertz of Madison, Wisconsin, referring to a lit-up B&M Baked Bean plant across the inlet to Back Cove from the house on the Eastern Prom where she was staying with friends Friday. Hertz said she expected to hear plenty of reports of northern lights from her neighbors when she returns to Wisconsin. An eerie, orange gibbous moon rose shortly after 9 p.m. Its glow meant the likelihood of seeing the lights was over for the night and, while the cloud of particles was expected to continue to affect Earth on Saturday, the best chance for the northern lights this far south was Friday night. Billions of tons of solar gas started bombarding Earth at noon Friday, but there was little worry that the solar windstorm would disrupt communications or energy grids, although Maine emergency management officials did take steps to protect equipment, just in case. Mallory said the high-frequency equipment is a backup system. The electromagnetic flux caused by the waves of charged particles in the atmosphere does not interfere with UHF and VHF communications. “It could throw some GPS off, definitely flights in the polar region. I don’t think we have to get too nervous in Maine,” he said. The upside to the solar wind gust was a decent chance it would energize the atmosphere enough that northern lights would be visible in Maine on Friday night. The possibility had sky watchers scanning the northern horizon. “This is certainly harder to predict than the weather,” said Margaret Curtis of the National Weather Service office in Gray, who was planning to head outside to scan the heavens for the rarefied light. Brett and Julie Leland of Portland brought their two children to the Eastern Prom on Friday, but their quest to see the lights ended shortly after 8 p.m., when their youngest announced he needed to go to the bathroom. There was a faint glow on the northern horizon for a short time after sunset, but it was more likely from a shopping mall parking lot than anything celestial. “If that’s it, then I’m disappointed,” Julie Leland said. The charged solar particles that started hitting Earth at midday Friday were the result of a coronal mass ejection that occurred Wednesday, the largest of a pair of eruptions at the sun’s surface that spewed plasma into space over the course of two Earth days, said Robert Rutledge, spokesman for the Space Weather Prediction Center, part of the National Oceanic and Atmospheric Administration. The superheated solar gases are traveling between 1 million and 5 million miles an hour but have to cover 93 million miles between the sun and Earth. Gleason said the aurora borealis appears three to six times a year in southern Maine to varying degrees. The science of the aurora borealis involves quantum physics and electromagnetism. The energized particles of the solar gases are drawn to the poles by magnetic attraction. Those particles excite the electrons of molecules in Earth’s atmosphere to a higher energy state, Gleason said. When those electrons lose that new energy, the energy is given off as photons of light. Different molecules give off different colors, accounting for the purple, green and magenta colors that sometimes tinge the aurora borealis. Often, however, they appear white to the naked eye because the human eye doesn’t see color well in low light conditions, Gleason said. Auroras can last for seconds, minutes or even hours, he said. Unlike most celestial phenomena, the northern lights are notoriously unpredictable and Mainers had a small window to see them on Friday, between sunset at about 7 p.m. and the moonrise at 9 p.m. At Earth’s magnetic north and south poles, the auroras are routine, but nobody lives there, Gleason said. For more information, updates, real time images of the extent of the aurora and animated images of the past 24 hours of activity, go to the National Oceanic and Atmospheric Administration’s Space Weather Prediction Center and spaceweather.com.